JUNE SPECIAL - CAMPSITES- This special includes 4 weekends in June (May 31 - June 23) and the cost is $490.00 (plus tax), no other campsite discounts apply. This special includes leaving your camper on your site the entire length of time from May 31 - June 23. If you wish to leave your camper hooked up to electricity Sun.-Thurs. the fee is $5/day. 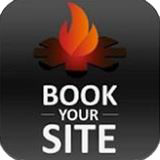 If you wish to stay on your site during the week you may pay the camping fee at that time. JUNE SPECIAL -The June and August Specials for campsites are growing in popularity and we are happy to continue this great camping tradition again this year by bringing you more choices in dates for you to decide on. It's all about choices and flexibility when it comes to planning your family camping vacations! JUNE SPECIAL: We have 2 dates for you to choose from to bring your family to a fun filled June camping trip! JUNE SPECIAL – CABINS/COTTAGES - This June Special applies to all the cabins, Rustic, Premium, Premium Plus, Deluxe, Deluxe Plus and Supreme Cottages. So be sure to book early as the cabins are becoming a sought after accommodation for grandparents as well as friends without campers who want to camp with their friends who have a camper. Book a Friday and Sat. night stay and get your Sat. night at 1/2 Price! (No other discounts apply) This deal can be used for the first 3 weekends of June (May 31st—June 16th). As an added bonus, if you wish to book back to back weekends in a cabin you may leave your things in the cabin Sun.-Thurs. so you don't have to pack and unpack again when you return to your cabin. This June Special applies to all the cabins, Rustic, Premium, Deluxe, Deluxe Plus and Supreme Cottages. So be sure to book early as the cabins are becoming a sought after accommodation for grandparents as well as friends without campers who want to camp with their friends who have a camper. CAMPING CABIN SPECIAL - Book any style of cabin for 5 nights or more on or before April 1st, 2019 and you will receive a special discount as follows: (no other discounts apply). Book a 5 night cabin stay and Receive 50% off your last night. Book a 7 night cabin stay and receive One Night FREE! AUGUST SPECIAL - CAMPSITES - This special includes the last 3 weekends of the summer, August 16th – Sept. 2nd and the cost is $440 (plus tax), no other campsite discounts apply. The August Special has the same policies as the June special. Pick your site early for any of these "Specials" and reserve today so you can enjoy leaving your camper on your site, saving time and money not hauling your camper back and forth. BUDGET SAVER - Stay 5 night and SAVE $50.00 (+tax) off your total cost of your stay (W/E site) or $47.00 (+tax) off your total cost of your non serviced site stay. Stay must include Fri. and Sat. nights or check-out on Friday. Must advise Ranger Station before 5th night if using Budget Saver. NO OTHER DISCOUNTS APPLY. NOT AVAILABLE ON HOLIDAY WEEKENDS. WEEKDAY BUDGET SAVER (BOO BOO'S BARGAIN) - Stay 3 nights ( Between Sun. - Wed. - I.E. Mon. & Tues. - Wed. 1/2 Price or Sun. & Mon. - Tues. 1/2 Price) and get the 3rd night 1/2 price. Advance reservations required to get this deal. NO other discounts apply. FREE CAMPER'S SWIMMING - There is no charge for our registered campers to swim at any of our pools. They include the heated waterslide pool, the camper's only heated pool and the children's wading pool. A current Swim Bracelet must be worn (or the Ultimate bracelet) and is available at Ranger Station. CLUB YOGI REWARDS PROGRAM – Join FREE at www.jellystonerewards.com where you can earn points to be redeemed for Free stays at any Jellystone Park ™ Camp-Resort. Ask for more details at the Ranger Station. Redeeming Points: Club Points can be redeemed for one of eight Tiers of accommodations. See what Tiers are available at our park as noted in the chart below. 1.) If you are planning another visit to Jellystone Park NB again over the summer you may leave your camper parked in our parking area at no charge. Then when you return you just hook up to your camper and go to your site. Save your gas towing back & forth! 2.) SAVE 5 cents off per litre on your gas purchase when you fill up at the Ultramar Gas Bar located at the end of the Campground driveway (Gas Bar Open Mon. - Fri. 7am - 6pm, closed Sat, Sun. and holidays). Show your current camper registration tag to receive this discount. 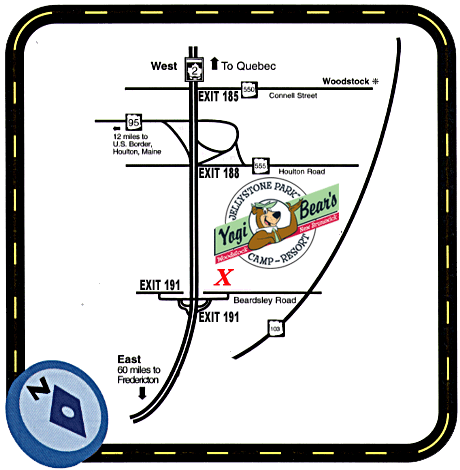 These gas savers are Yogi's way of saying "Thank You" for staying and playing with Yogi Bear this summer! VISITORS: Visitors are welcome to visit you at your campsite/cabin while you are staying at Jellystone Park. They must register at the office and pay a Day Use Fee of $3.00 per person (ages 5 yrs. and over) with a maximum of $8.00 per vehicle. They will receive a Visitor's Pass for their vehicle. If their visit is less than 20 minutes, the fee will be refunded. They may purchase a Super Fun Pass ($26.95 + tax) at the Ranger Station to enjoy the amenities while visiting you. Family packages are also available, ask at Ranger Station for details. No visitors may enter before 9:00 am or after 10:00 pm. All Visitors must leave park by 10 pm weekdays and 11:00 pm on weekends.